I first became acquainted with Quentin Blake through his quirky illustrations for Roald Dahl’s novels and books of verse when my children were growing up. Dahl’s stories are often hilarious in themselves, but Blake always seemed to capture the essence of Dahl’s characters in his drawings and add even more to the humour. Quentin Blake has more recently illustrated stories he has written himself that are wonderful to read and enjoy. Most of them centre on a particular, sometimes eccentric, character. ‘Mrs Armitage Queen of the Road‘, for example, is a bespectacled, grey-haired lady whom we first meet in striped pyjamas and a brown dressing-gown, sitting opposite her smiley dog at the breakfast table. Who would imagine that she later teams up with a Hell’s-Angel-style group of motorcyclists who dress her up in a leather jacket and studded collar? This is the fantastical reality of Quentin Blake’s world. Mrs Armitage’s outing begins when her Uncle Cosmo hands his old crock of a car to her as he now has a new motorcycle. She is not impressed with it but nevertheless sits Breakspear, her dog, in the back and sets off. Various mishaps occur that involve parts of the car falling off, but Mrs Armitage is not fazed; she throws them on the scrapheap each time and continues her journey, eventually arriving in the countryside. Things reach the point where the car has lost all its doors, as well as the bonnet and various smaller parts. By coincidence she then encounters Uncle Cosmo and his friends coming the other way on their motorbikes. They are so impressed by Mrs Armitage’s strange-looking ‘machine’ that they invite her to go with them to the Crazy Duck Cafe for billiards and banana fizz. This, then, is how Mrs Armitage becomes Queen of the Road. The illustrations obviously count for a great deal in any book by Quentin Blake. We see poor Mrs Armitage with a succession of glum faces as she disposes of various car parts on the scrap heap, but the builders watching her throw the roof away seem pretty amused. She looks so much happier when she meets Uncle Cosmo and his gang, a motley crew of bearded, booted or in one case big-busted bikers. Breakspear looks delighted as he sits behind Mrs Armitage and they speed off down the country road, followed by the rest of the gang, all beaming amongst clouds of exhaust fumes. There is a lot of fun with onomatopoiea in this book, with Blake inventing words such as beoing and kerrunch when the car comes to grief. There are generally about three or four lines of text per page in a large font on a white background, so reading is made easy. I have heard of this book appealing to children as young as three and as old as nine, by which age of course they should be able to read it themselves. 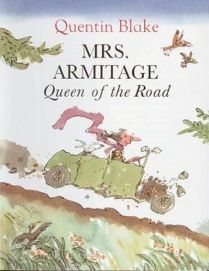 ‘Mrs Armitage Queen of the Road‘ is a wonderful read-aloud book, but may not appeal to children much younger than four-years-old. There are apparently at least two other books in Blake’s series about Mrs Armitage, ‘Mrs Armitage on Wheels‘ and ‘Mrs Armitage and the Big Wave‘. Quentin Blake’s books are a lot of fun to read, not least because his drawings add so much to the humour of the story. No Comments on "Mrs Armitage Queen of the Road"